Rollei has announced a new 3D camera called Rollei Powerflex 3D. The Powerflex compact camera contains a 5 megapixel image sensor and a pair of lenses to create 3D photos. It also has a 2.8″ LCD screen and it is able to digitally zoom 8x. The camera can also capture regular 2D photos. 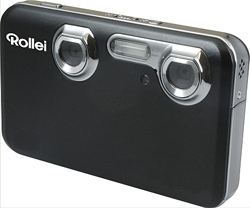 The Rollei Powerflex 3D will be available in January 2011 and cost about €299.95. Rollei is getting started in the third dimension in 2011 by presenting its first-ever products for an impressive 3D experience with the Powerflex 3D digicam and the Designline 3D digital picture frame. Rollei’s new 3D devices are equipped with the special Parallax Barrier Display technology, so that you can marvel at three-dimensional pictures and videos without any special glasses whatsoever. With Rollei’s new Powerflex 3D, it is possible to easily produce three-dimensional photographic and video works of art by yourself. Two lenses that work simultaneously with 1/2.5” CMOS image sensors record 3D pictures with a maximum resolution of 2592 x 1944. Videos can be shot in brilliant HD quality (1280×720) at 30 images per second. The pictures appear on the 2.8 inch LCD display with a resolution of 640 x 480 pixels in such a way that each one of the observer’s eyes sees a slightly displaced image, which is then automatically merged into a three-dimensional image. This effect provides 3D enjoyment without glasses. The two-eye, 5-megapixel Powerflex can naturally also photograph and film in 2D. An 8x digital zoom is available in 2D mode as well. Pressing a button on the camera switches between 3D and 2D shooting modes. You can make use of technical features, such as the digital image stabiliser and the manually adjustable white balance, in both shooting modes. But the technical features are not the only reason why you won’t ever want to do without your Powerflex 3D. The camera’s slim design and the intuitive menu navigation are also very persuasive. Anyone who would like to admire his own 3D works on a large scale can easily connect the Powerflex 3D to a 3D TV set or monitor thanks to the HDMI connector and TV output (PAL/NTSC). With the help of the special glasses that belong to the respective screen, you can dive into the 3D world that you photographed yourself.